Nestled between Baltimore and Washington D.C., Glenwood, Maryland is the perfect spot for commuters. When you come home from a long drive and an even longer day at work, what could be better than diving into your very own home swimming pool? 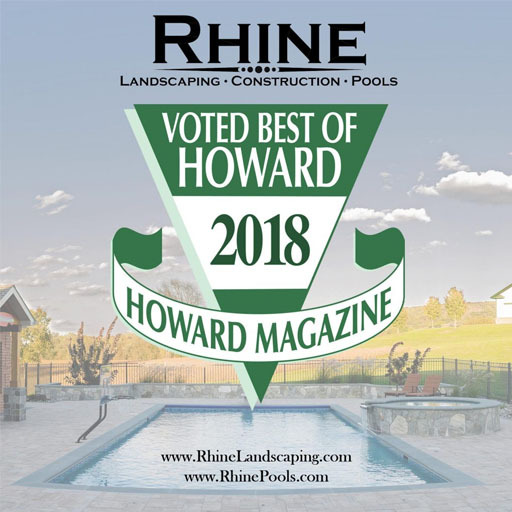 Rhine Landscaping can create the ultimate swimming pool and homeowners are sure to find the perfect outdoor design to make your house a home. A design that works in one yard could destroy another. It is important that when your project is done, it’s done right. Improper planning can result in expensive drainage problems that will destroy your budget and your timeline. Our qualified landscapers, architects, and engineers will work together to create a plan that works with the unique features of your yard. Your new swimming pool will be thoughtfully designed, taking balance, elevation, and functionality into account. With Rhine Landscaping, you won’t just get a pool; you get a beautiful outdoor living space that brings your family and friends together. Our designers pull inspiration from your existing architecture, landscape, and hardscaping to bring your vision to life. We can integrate waterfalls, hot tubs, and even water slides to make your swimming pool exciting and unique. Creating a customized swimming pool in your back yard is no small task. At Rhine Landscaping we understand the stress and chaos that goes along with such a major project. We’ll maintain a strong and open line of communication from the moment you request a quote until you are swimming in your finished pool. Your budget and timeline are as important to us as they are to you, and we will make sure you never have to worry. Your satisfaction is our number one goal. Rhine Landscaping has built a reputation of excellence in Sykesville and its surrounding areas and would be happy to take on your project. Contact Rhine Landscaping today to start making your swimming pool dreams a reality. Call 410-442-2445.